But not all online marketers found Google’s updates to be devastating. Those who built a strong foundation in solid, white hat online marketing practices weren’t affected like marketers who cut corners and tried to game the system. These sites found their rankings plummet, and deservedly so. Unfortunately, there were also those website owners who were stuck in the middle. Companies and individuals without a dedicated marketing team to test and tweak their strategies also saw their rankings dive. Most of the websites in this category were run by business owners focused on day to day operations. Marketing is only a small fraction of daily operations, which means they didn’t have the time to understand the practices and testing that goes into online marketing. Instead, these business owners picked up techniques here and there, but were often unaware of how and when to use different practices. If this sounds like you, this overview can help you understand basic online marketing practices and how to use them. But knowing what each facet does for your website isn’t enough. As many people discovered after the recent Google updates, applying even well-established marketing techniques incorrectly way can hurt your ranking. To maximize their benefits, you also need to understand their shortcomings. 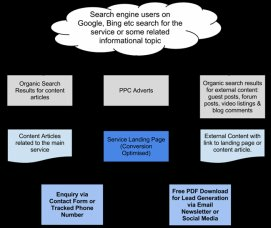 [Online Marketing Strategy] Five Key "Website Strategies"